"Little green men" or "Russian invaders"? Image caption Highly organised local 'self-defence groups' or Russian military? The internet has no shortage of photographs and videos showing armed men in Crimea who look like members of the Russian military. Their guns are the same as those used by the Russian army, their lorries have Russian number plates and they speak in Russian accents. Yet according to President Vladimir Putin, they are in fact members of "self-defence groups" organised by the locals who bought all their uniforms and hardware in a shop. This poses a challenge to the media covering the crisis: what do you call people who are officially not there? The state-run and pro-government media in Russia have chosen to take little notice of them, and the heavily armed men are rarely if ever shown on TV. Instead, they show groups of lightly-armed "volunteers" described as local "self-defence groups". Russian journalists less aligned with the Kremlin often use the phrase "polite men". 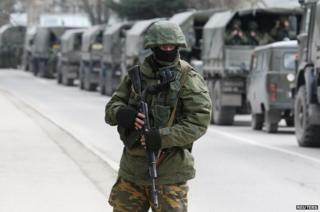 According to centrist daily Nezavisimaya Gazeta, "'polite, armed men' are in charge of Crimea now". Describing them as Russian troops in the Russian media "is not the done thing, and even dangerous, too," prominent photojournalist Denis Sinyakov comments on independent website Colta. According to popular blogger Ilya Varlamov, the term "polite men" was invented by spin doctors who arrived in Crimea from Moscow. "They are creating an image of a Russian liberator-soldier wearing a nice new uniform and armed with beautiful weapons, who has come to defend peaceful towns and villages," Mr Varlamov says. Another phrase used by reporters in Russia and Ukraine alike is "little green men", which refers both to the colour of their uniforms and their unconfirmed origin. Image caption The soldiers are often described as "little green men"
Their involvement in Crimea is a "tragicomic masquerade", says Russian liberal newspaper Novaya Gazeta, which argues that "the little green men will turn into Russian troops very soon". According to Kiev-based private TV channel One Plus One, the term "little green men" was coined by local residents in Crimea. It is now frequently mentioned on Ukrainian TV, by a defence ministry spokesman in his posts on Facebook and even by Prime Minister Arseniy Yatsenyuk in his recent addresses to parliament. Some Ukrainian journalists have criticised the use of this term. "Colleagues, stop using the affectionate term 'little green men' to describe the Russian troops," tweeted journalist Svyatoslav Tseholko. "Otherwise you get the impression that we trust Putin more than we do common sense." Image caption The unconfirmed but obvious origin of the troops creates a "tragicomic masquerade", media say. Most journalists in Ukraine, however, have little doubt about the true identity of the pro-Russian armed men. Image caption Ukrainian papers openly call the troops "Russian invaders"
"Russian invaders" and "occupiers from Russia" is how popular Kiev-based news website Ukrayinska Pravda describes the military men in Crimea. Meanwhile, analytical daily Den calls them "Russian extremists", echoing language used by the Russian media to describe Islamist militants. Even outlets previously supportive of ousted President Viktor Yanukovych - such as Segodnya, a tabloid owned by Ukraine's richest man Rinat Akhmetov, - are now calling the military presence in Crimea "an armed intervention". Ukraine's most popular TV channel Inter is treading a more cautious line. Previously critical of the protests that led to President Yanukovych's downfall, Inter speaks of "unknown armed men" in Crimea. But it also said that they were bringing Russian military hardware to the peninsula. Image caption A soldier in unmarked but apparently Russian military uniform guards S300 surface-to-air missiles in the port city of Sevastopol.